Marigold flowers have a sunny disposition, producing bright and colorful blooms and thriving in full sun. The chrysanthemum-like flowers bloom in a range of colors including, yellow, orange, mahogany and bicolored flowers. The bright green foliage is often fragrant and the blooms attract butterflies to the garden. Tucked into a container or used as fresh-cut flowers, marigolds create a showy display, no matter where they grow. American marigold (Tagetes erecta) is an annual flower with a clumping form that blooms during summer to light up the garden with color. 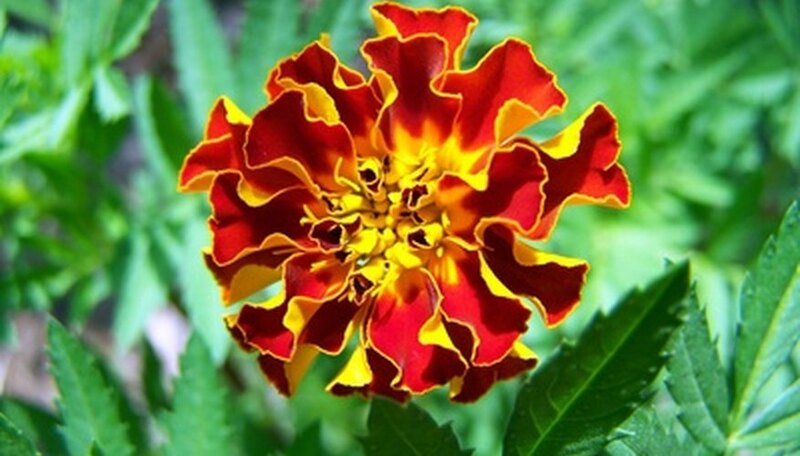 Growing 1 to 4 inches tall, American marigolds have a double flowerhead that grows 2 to 6 inches wide. The flowers come in a wide range of colors including, orange, yellow, mahogany and white. Because the flowerheads on American marigolds are heavy, they many require staking to keep this annual upright. They grow best in full sun and moist, well-drained soil but tolerate dry soil. Hardy in all USDA hardiness zones. French marigold (Tagetes patula) is a summer-blooming annual with a bushy growth habit. The small single flowers on French marigolds range from double to semi-double in form. Often the petals are bicolored and tipped or striped with mahogany or red. Growing 6 to 12 inches tall, French marigolds require deadheading, or removing the spent blooms, to promote a long flowering season. They grow best in full sun and well-drained, moist soil. Hardy in all USDA zones. Signet marigold (Tagetes temurfolia), a variety of marigold, is an annual flower that grows 8 to 18 inches tall. The single flowers are yellow and orange to produce a cheerful display among the garden. According to North Carolina State University Extension, “leaves are pinnately divided producing a fern-like effect.” Signet marigold flowers require full sun and well-drained soil to thrive. Hardy in all USDA zones. Marsh marigold (Caltha palustris) is a perennial marigold variety that grows 1 to 2 feet tall with a mounding, clumping form. Emerging in spring and lasting into summer, Marsh marigolds have a broad flower that grows 1 to 1 ½ inches wide. The five- to six-petaled flowers are bright yellow to contrast with the green foliage. The heart-shaped leaves on marsh marigolds grow 2 to 6 inches long with a toothed edging around each leaf. Marsh marigolds require full sun to part shade and moist, well-drained soil. Plant marsh marigolds in USDA hardiness zones 3 to 7.